of the Iraq Study group go to the Senate Armed Services Committee for more testimony about the report and it’s conclusions today. The Committee, apparently wants to know more about how the Study Group reached its conclusions. I’d love to know if any of you bought the Iraq study group book? It’s apparently rising to the top of the best-seller list on Amazon.com! Brian Williams put his full interview with the Chairmen of the Study group online(we’ll see if this works). It got even colder when wind knocked a tree into a power pole near Runnells late last night. Some people were without power(power=heat) for about three cold hours last night. I wondered if there were resources online about what to do in the case of a power outage in the winter. I found some on the California Consumer Energy Center Page. Bottom line here is be prepared. We’re going to warm up again this weekend. It’s going to be another good opportunity to do some insulating, and stocking up on those winter emergency items you need for your home or car. This is a success story from Police. Yesterday a citizen tip led to the arrest of one of the Metro’s Most Wanted. Check the list…see if you can help too. Polk Co. Crimestoppers phone # is 515 223-1400. They want your info, not your name! The Shuttle Discovery only has about a 40% chance of lifting off tonight because of overcast conditions. That DOES NOT effect the Science Center of Iowa’s extended hours to cover the launch. I’m told they’re going to stay open till nine tonight. They’ll have the launch on a big screen if it is a go…and they’ll have a space expert answering questions. One of the gem’s of the Science Center staff is it’s space expert. This guy is a walking encyclopedia of space knowledge. If you get a chance…go see him in action. People have their “things” that they think are important when other people don’t hardly pay any attention. Mine is World War 2 and Pearl Harbor so please allow me a little latitude. This will probably be more than you wanted to read about. in the interesting conversations I’ve had with Vets. I love these guys. They are certainly the Greatest Generation, but more than that they understand the context of their service before and after the war in a way I’m not sure all of the generations who followed do. Here in Polk County I’ve been lucky enough to interview several members of Iowa’s Pearl Harbor Society. Every year their numbers thin a little, but I’ve saved the raw tapes of my interviews with them at the 60th anniversary of the attack on PH. I regard that set of interviews as some of the most interesting conversations I’ve had the good fortune to be a part of. That group usually gets together every year for a breakfast on Pearl Harbor Day. A side note, I fulfilled a long time wish this year by visiting Pearl Harbor. I’ve read the books and seen the movies and documentaries. The reality didn’t exactly match up. Don’t get me wrong, I loved it. It just didn’t fit the picture I had in my head. The displays you walk through before you go are really interesting but the number of tourists around you makes the atmosphere a little hectic. It does not mach the solemnity I associated with Pearl Harbor. The USS Arizona Memorial was much better… though I messed this one up when I thought we had to go back on the boat we arrived on. It made the visit to the memorial shorter than I would have liked. The coolest part of the visit was what’s called the “tears of the Arizona”. They estimate 1 quart of oil leaks out of the Arizona’s hull every year. It comes up in droplets that look like tears. When they hit the surface the oil spreads and shows a rainbow effect. It’s one of the most emotional parts of standing over the final resting place of hundreds of sailors. I’ll post some pics from our visit later. As a side note, there was no news of the Pearl Harbor Day Ceremonies today at eleven at the state capitol. No meantion on the State of Iowa website, The governor or Leutenant Governor’s website, Veteran’s Affairs, County Veteran’s Affairs, American Legion, The Newspaper, and unless I missed it we didn’t get a news release announcing the ceremony. I know these men are dwindling in number and usually this ceremony passes without much notice, but to me it borders on disrespect to not remind us all every year in as many ways as possible. A new report released by the Brookings Institute talks about the number of people who fall blow the poverty line having moved to suburban communities. You can read the whole thing here(pdf). In a study of the 100 largest urban areas Brookings finds for the first time the burbs have more poor people than urban areas. Des Moines bucks this trend with the lowest percentage of suburbanites falling below the poverty line. I’d be interested to talk to suburban mayors and city officials around our metro about this. This is just a wild guess, but I’d say while the number of poor people is low compared to other cities, I bet it’s a lot higher than it was ten years ago. I’d bet we take this question up today in some way shape or form. final week or so. I really don’t get into the weekly shows but if you get a chance, you should watch next week. The progress that these people are making is amazing. This is something I think a lot of us can relate to. It’s hard work losing weight and keeping it off. It is even harder to make the right choices in your life. If you watch the finale and don’t feel like going out and losing some weight or at least making healthier choices …I’m thinking you’re beyond help. The show highlights all the right reasons for weight loss(self confidence, mental health and reduced risk of things like diabetes) without going overboard on image. Last night they featured a school in Belle Plain Iowa and some kids there. The difference that a little help made in these kids lives was stunning. Watching the choices they have to make at school lunch was discouraging. If we don’t get it through to some of these teenagers, weight will rival smoking as a health crisis in ten years. Weight didn’t catch up to me until my twenties…It’s catching up to an increasingly stagnant generation of kids a lot earlier. He is The King, But…. It’s Trisha now. I’m about to run out on assignment so I only have time to add this one quick Elvis story as I promised on the air! 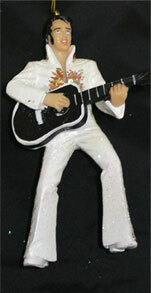 I pulled the Elvis ornament out of the box and showed it to my 4-year-old, Calvin. He wrinkled his brow and stared for a second. No, not the prince of peace, the king of rock, but close. I liked your tribute for Pearl Harbor Day. All three of my dad’s brothers were on the Oklahoma battleship. Fortunately they all survived the “Day of Infamy”. They attributed it to being up early for Sunday morning mass. They have all passed away now but it is a special day for our family. I am laughing so hard! How funny!